This is the second thread to watch along with the petrodollar system unraveling. Prophecy has foretold that during the last days, when the Antichrist rises, there will be one world government, which he will assume control of. One of the key hurdles that still remains is the US as a sole superpower. We are seeing that break down now, and the collapse of the US dollar will be a major part. Are you ready for Inflation, Hyper-inflation, and a collapse? With attention focused on sovereign-debt worries in Europe, two major credit-rating firms reminded investors again that the U.S. has debt problems of its own. Investors bought Treasury debt nonetheless, ignoring the comments, which echoed prior statements by the companies and may still be months or years away from having any practical meaning. Moody’s Investors Service said in a report on Thursday that the U.S. will need to reverse the expansion of its debt if it hopes to keep its “Aaa” rating. “We have become increasingly clear about the fact that if there are not offsetting measures to reverse the deterioration in negative fundamentals in the U.S., the likelihood of a negative outlook over the next two years will increase,” Sarah Carlson, senior analyst at Moody’s, said. What will trigger the collapse of the US dollar? Amazing article and video, MUST SEE!!! It not only illustrates how the world is moving away from the dollar as the major currency, but what state the world finds itself in and how the US role has been written off. To quote the final guess, the US is “done”. It is huge for the US to be the reserve currency, it helps drive demand for countries and people to keep our currency. If that would ever stop, then you would see our dollars value tank as people/countries drop our dollar. The dollar value tanking means inflation and hyper-inflation. Russia and Germany should dramatically increase their economic co-operation. That’s the message from Russian Prime Minister Vladimir Putin to some of Germany’s top industrialists at a business forum in Berlin. The Federal Reserve launched a controversial new policy on Wednesday, committing to buy $600 billion more in government bonds by the middle of next year in an attempt to breathe new life into a struggling U.S. economy. The decision, which takes the Fed into largely uncharted waters, is aimed at further lowering borrowing costs for consumers and businesses still suffering in the aftermath of the worst recession since the Great Depression. 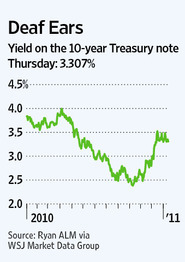 The U.S. central bank said it would buy about $75 billion in longer-term Treasury bonds per month. It said it would regularly review the pace and size of the program and adjust it as needed depending on the path of the recovery. More discussion on the future of the dollar and global currency…. The dollar’s slump could get far worse if the dollar index takes out last year’s low, Robin Griffiths, technical strategist at Cazenove Capital, told CNBC Monday. A commerce ministry official denied a report that China would cut export quotas for rare earth metals by 30 percent next year, the China Business News said on Wednesday. A day earlier, an unnamed commerce ministry official told the China Daily that Beijing would reduce the quotas to protect the country’s rare earth resources and avoid depletion of the crucial manufacturing minerals. The China Business Daily, also citing an unnamed Ministry of Commerce official, said that report was groundless and that no such measures would be implemented. The conflicting reports in state media compounded questions about how Beijing plans to manage its reserves of the minerals, used in products from autos, computers and cell phones to missiles and new energy technologies. China accounts for more than 90 percent of the world’s production of rare earth metals. “It is not going to happen in this country,” Geithner told Silicon Valley business leaders of devaluing the dollar. Geithner broke his silence on the dollar’s protracted slide ahead of this weekend’s meeting of finance leaders from the Group of 20 wealthy and emerging nations in South Korea, where rising tensions over Chinese and U.S. currency valuations are expected to take center stage.